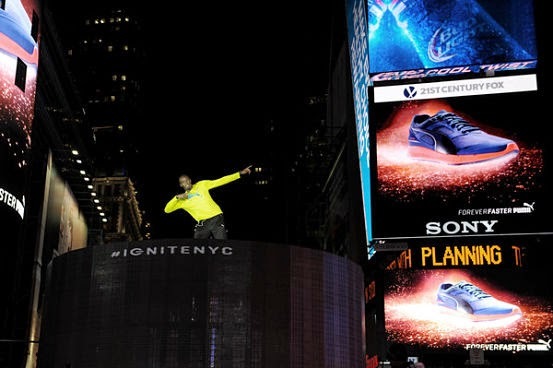 SKY'S THE LIMIT: Bolt reaches for new heights as he helps launch PUMA's Ignite sneakers in New York. It turns out The World's Fastest Man will be going the distance after all. Sprint king Usain Bolt has confirmed that the Rio Summer Olympics in Brazil won't be his last hurrah as initially planned. Instead, the Olympic champ has opted to go for another year and hang up his spikes after competing at the World Championships in London in 2017. Terrific news for fans of the showman and Jamaican golden boy, who is doing the Paris Diamond League meet in France in July. "That was my initial plan to retire in 2016, but my sponsor has asked me to go for another year to 2017 and London," Bolt recently told the UK's Daily Mail. "I'll be doing one event, the 100 [metres]. I've already discussed it with my coach. So I can concentrate on that and on retiring on a winning note." Returning to Beijing, China, on a winning note is also in the cards for the sprinter, whose loyalists are anticipating the kind of golden runs in both sprint events that hark back to his dazzling exploits at the Olympic Games seven years ago - when it all started for real. "If everything goes well this season, anything is possible," Bolt concedes, looking ahead to the 15th IAAF World Champs. "If I can get myself in good shape, it should be wonderful this season." Adds the unpredictable 28-year-old: "I live for competition. I thrive on competition. I live to compete against the best. It means a lot when you beat the best."